Hanging toiletry bags for men and women have been around for years and they have become an essential part of travel accessories. And there are many companies that make travel toiletry bags today, which is why finding the best travel toiletry bag can be time-consuming. Therefore, we decided to write in-depth best toiletry travel bag reviews to make it easier for you to get the toiletry bag that suits your trip. It took us days to finalize our best carry on toiletry bag buying guide and we hope it helps you better organize your travel essentials. In addition to top women and men’s personalized toiletry bags, you can learn about the types, airline restrictions and things to look for in hanging bags. But before that, let’s see the comparison chart for the best travel toiletries bag. What is the best travel hanging toiletry bag? While the answer might be just this and that sometimes, in many cases it varies based on who is looking to buy the toiletry bag. To make it easy for you, we categorized all the types of toiletries bags for men and women. This toiletry bag review includes rolling, folding, upright, hanging, leather, and nylon bags. 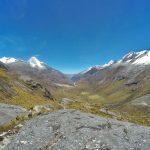 Seeing the pictures will also help you decide which one better fits in your luggage and type of your trips. 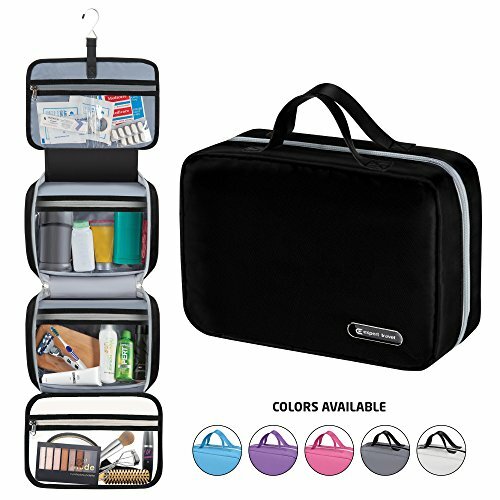 It’s an excellent hanging toiletry bag for women and men with multiple zippered pockets and internal compartments for your shampoo, body wash, and other accessories. This men and women’s large toiletry bag is available in five colors for every taste. Featuring two internal mesh zipper pockets, and four pockets with elastic bands that allow you to easily organize and find your items. Unlike conventional travel toiletry bags, it has space for all cosmetics, shaving accessories etc. There are two zipper side doors with elastic bands and small pockets to hold your toothbrush, toothpaste, and other hygiene products. 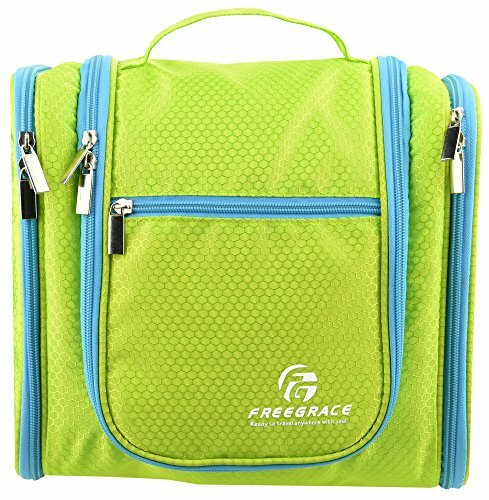 Freegrace nylon toiletry bag comes with a durable hanging hook that makes using it during trips and at home very easy. With metal hook, cotton cushion, premium nylon, several compartments, and a good size it’s the best travel hanging bag in our review. It also has 90 days money-back warranty which is unique for cosmetic and toiletry bags under $25. ⇒ If you are in Australia, click here. With water-resistance interior and detachable pocket, it’s one of our most favorite hanging toiletry bags. It can prevent leaks inside your luggage and its detachable pocket allows you to take your essentials with you when you don’t want to take the whole bag. It offers 5 zippered clear pockets that help you easily find your accessories. The clear plastic pockets are thick and more durable compared to some cheap travel cases for toiletries. The premium YKK zippers work well and don’t get stuck. The metal hook makes it easy to hang the bag and access your accessories. Last but not least, they offer a lifetime warranty for this top personalized hanging toiletry bag. Available in multiple colors and in a very compact size, the NeatPack personal organizer is perfect for your weekend trips. It has a mesh zipper pocket, two mesh side pockets with elastics and transparent zipper pocket which helps to organize better. It doesn’t have a detachable pocket, but since it’s small you can carry it anywhere. This cosmetic bag features water-resistant nylon and lining to prevent leaks. It comes with lifetime warranty, money-back guarantee and a durable metal hook for easy access to your essentials. 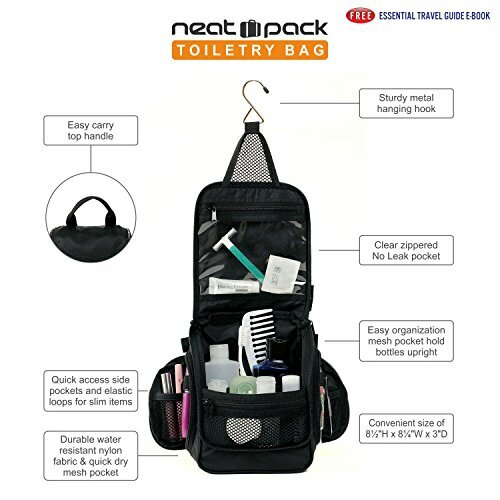 Overall, if you are looking for bathroom travel bags for women with compact size for short trips, the NeatPack is a good choice. It’s also relatively cheaper compared to some other ladies large toiletry bags on the market. Featuring a compact and comfortable design, this travel toiletry bag with hanging hooks makes your trip easier. It has a standing open face design with a steel hook to hang it steadily and allow to access to toiletries and cosmetics easily. With easy carry handle, side pouches and mesh pockets, it’s one of the best compact toiletry bags for men and women. The interior design includes deep storage, two mesh zippered pockets, and multiple slide pockets. This waterproof toiletry makeup bag can also prevent leakage inside your luggage. It’s available for less than $20 and in many colors so you can choose what suits your style. This travel kit bag has a lifetime guarantee which proves the quality of the product, and with the purchase, you receive a free packing checklist e-book. 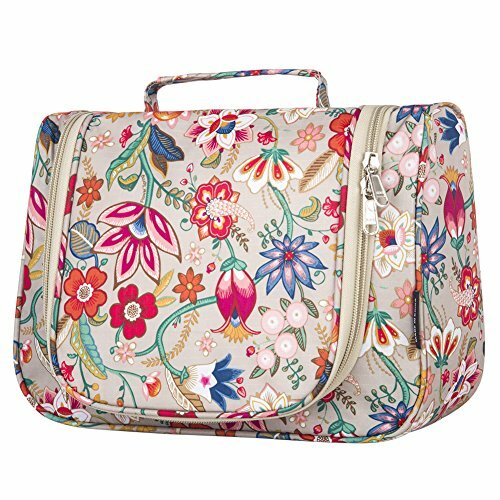 Due to its color and design, it fits the criteria for both women and men’s travel bags for toiletries. The features include a metal swivel hook that rotates 360 degrees. It also has smooth and durable premium YKK zipper and several pockets for better organizing your travel essentials. The side pockets allow you to easily access your travel items without unpacking all your accessories. The inner compartments include pouches with elastic bands and 3 mesh zipper pockets for your travel bottles. Overall, it’s one of the best hanging travel cosmetic bags and if you don’t care about the lack of detachable pocket, we highly recommend it for you. In this toiletry bag review, Yeiotsy is one of my most favorite items. This product is relatively new on the market so you won’t see too many consumer reviews. 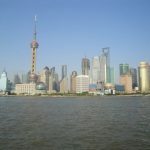 However, looking at the design and structure, you can have a good idea of its quality and capacity. Yeiotsy is a women and men’s travel toiletry bag available in 5 colors. It features anti-bacterial lining, water-resistance fabric and smoother zippers that allow for a better and cleaner trip. It has two side pockets on each side, so 4 side pockets in total. Two of the side pockets have elastic straps for your razors, toothbrushes, supplies and bottles, while the other two pockets can hold your small towels. The interior design includes a large compartment and 3 mesh pockets featuring steel zipper pullers. Bottom line, it’s one of the best travel makeup bags under $30 for extended trips. One of the pretty toiletry bags for women is the B&C hanging cosmetic bag. This large hanging travel make-up bag is made of sturdy 600D polyester, elastic PVC, and touch zippers to meet your expectations. 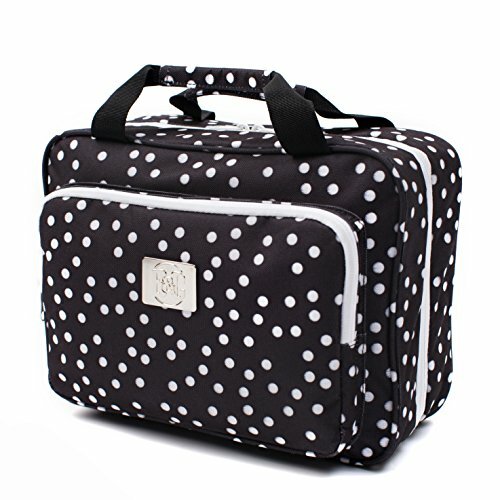 The white dots add a nice elegant look to this multifunctional travel cosmetic organizer. The features that make this product the best women’s toiletry bag are the hanging hook, design, and durability. The steel hook can hold up to 10-pound weight and the XL-size pocket fits full-size toiletry bottles. But that’s not all, it also has a comfortable top carry handle and a zippered detachable pouch. With over 300 top-rated consumer comments and 100% satisfaction 30-day free return, it’s a good purchase. Overall, it’s the best hanging travel makeup bag for women in this toiletry bag review. This is perhaps the cheapest toiletry bag for women with multiple compartments for your makeup and other toiletries. It has a very cute outer design and multifunctional inner design. It has a large capacity for your cosmetic, shaving and other travel accessories and personal items. The inner compartments include a clear zipper pocket, two mesh pockets and a large section for your full bottles. It also has a durable plastic hanging hook, a comfortable carry handle and water resistant outer fabric. However, the HaloVa travel hanging organizer bag for women lacks in a detachable pocket and elastic bands. All in all, it’s the best value for the money with 1-year replacement warranty and 90-day 100% refund policy. With over 900 top-rated consumer reviews, it’s one of the best women’s toiletry bag products in this review. With this hanging toiletry bag, you get a sturdy hook for easy hanging, several large mesh pockets that can hold your bottles upright, and a large storage compartment for your cosmetics. It also has a thick padding on the sides and bottom to protect your perfume, hair clipper, razor, lotions, etc. Its elegant look fits perfectly the female travelers. Overall, it’s a good hanging toiletry bag with high-quality zippers and nylon fabric. And if in the end, you don’t like their travel makeup bag, you can send it back and get a full refund. Featuring high-grade PU leather, this men’s toiletry bag is water-resistant and easy to clean. 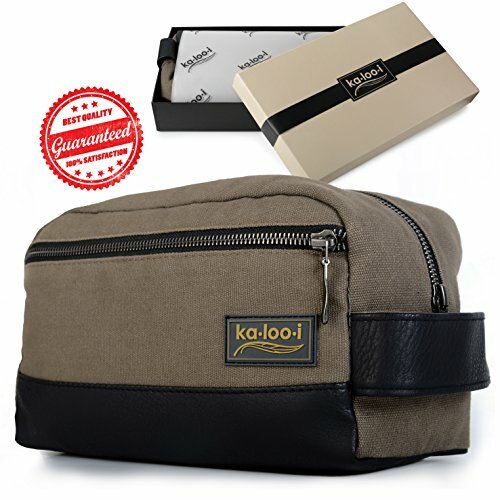 Made by Italian designers, this hanging toiletry kit also has a timeless luxury design that will always look good and stand out. This leather travel toiletry bag for men features 2 snap fastened pockets and 2 zipped pockets (making 4 internal pockets). It has a hanging hook for showers, bathroom etc, but you can also use it as a flat-lying Dopp kit to access your travel essentials. Other features of this men’s small toiletry bag are expandable pockets, reinforced steel hook, stainless zippers, and stainless snaps. It’s compact, perfect for short trips and last but not least, it’s made of cruelty-free vegan leather. This bag features top-of-the-line canvas lining on the outside and water-resistant inside lining pockets. It’s made of real leather and handcrafted by skilled craftsmen. It has 2 zippered and 2 snapped internal pockets to hold your travel toiletries. 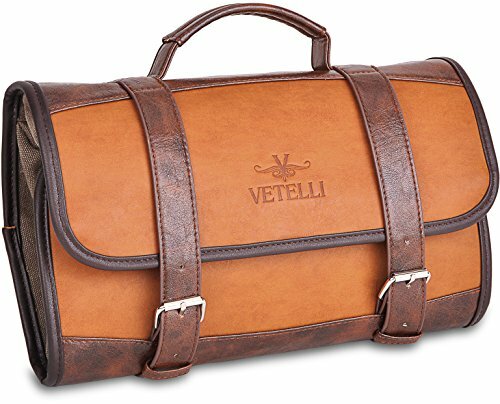 More than 90 5-star rating reviews verify that it’s one of the best men’s travel bags with buckles and classy design, hanging hook and comfortable top carry handle. Overall, it’s a good affordable leather toiletry bag with durable zips. 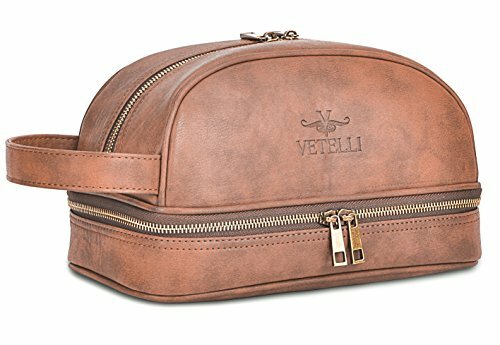 One of the best seller men’s leather toiletry bags is this model by Vetelli. The brand is popular for making the best toiletry bag for men. They offer a lifetime guarantee which proves how much they trust their products. It’s compact and can’t be hanged but it has 1 large compartment and 2 inner zipper pockets. Other features include nylon inner lining, water-resistant inner bottom, durable steel zippers and a classic style. This small bag has been reviewed as the best toiletry bag for backpacking for men due to its compact size. It’s a classic Dopp kit that features luxury and prestige design. 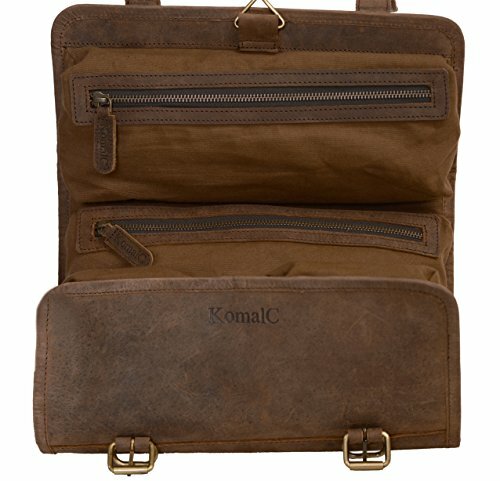 If you are looking for shaving bags for men or the best men’s toiletry bags for weekend trips, we recommend this vegan leather bag. It’s compact and has an easy access outer zippered pocket which is not available on many other men’s travel toiletry bags in this price category. The waterproof lining prevents spills and the 12-oz canvas material keeps the bag sturdy and in a good shape during the trip, while the side handle makes it easy to carry. In addition to an exterior pocket, it has 2 interior pockets to allow you to neatly organize your belongings. Our last word is that it’s not one of the best men’s large toiletry travel bags but it can hold enough shaving kits/toiletries for a short trip and is worth the money. Like any other travel accessory, the travel toiletry bag sets have features to be aware of before buying. Unless you know what to look for in hanging toiletry organizers there is a chance you get something that doesn’t exactly fit your needs. Here is a list of features to consider before buying your next best travel toiletry bag. Hanging toiletry organizers are divided into four size categories. A small travel toiletry bag is perfect for solo travelers or when you are packing items only for one person for a short trip. 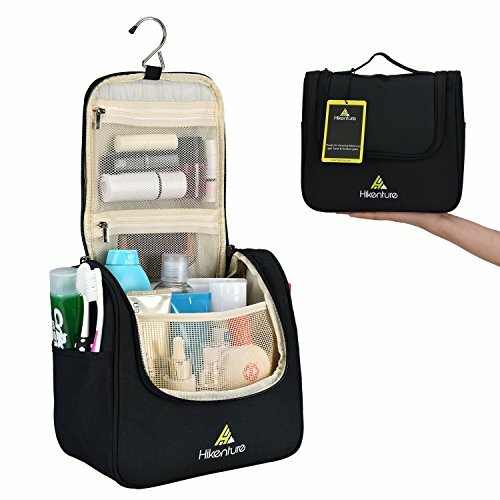 If you go for a medial hanging travel toiletry bag, it’s perfect for long trips since it can hold more compared to small size travel toiletry bags. While the large travel toiletry bag and the extra large toiletry bag can be used to pack toiletries for more than one person. So, depending on the length of your trip and how many people you pack for, you can decide to pick the best carry on toiletry bag for you. Some of the best hanging toiletry kits cosmetic bags also known as customized toiletry bags offer detachable pockets. This feature allows you to decide the size of the bag depending on how long you are traveling. The best hanging travel toiletry bag with TSA-compliant detachable clear pocket makes airport screening much easier. They are also good for carrying essentials for a day at the beach or a trip to the gym. 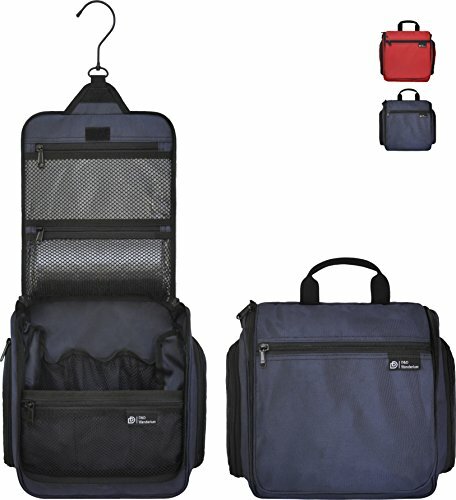 The best hanging travel toiletry bags offer clear and mesh interior and exterior pockets. Travel toiletry bags that set with clear pockets allow you to see your toiletries without having to unpack all your items. The mesh pockets dry easy and help to keep your items better organized rather than stacking them all on top of each other. So, the more pockets your cosmetic toiletry bag has, the easier it will be for you to organize and access your travel bottles, lotions, etc. Another good feature of the best travel toiletry bags with detachable pocket is that you have the option to change the size of the bag to fit the cabin luggage, suitcase, backpack and carry on. A top airline-approved toiletry bag has elastic straps to allow you to better organize your slim items such as toothbrush, razor, etc. A hanging toiletry bag with elastic loops keeps your personal care, beauty products, and travel accessories in place during the trip. You also wouldn’t have to unpack because you will be able to easily access your travel items while the bag is hanged. Top travel cosmetic bags feature solid material and a flat sturdy base to make sure your toiletries stay upright throughout the trip while hanging and sitting on the shelf. A personal toiletry bag with this feature can prevent spills and keeps your clothes clean. The best travel toiletry organizer bag comes with water-resistant pockets and outer fabric. These top waterproof travel bags for toiletries can prevent leaks and contain the mess in case of spills. It’s an important feature to look for when buying a travel toiletry bag for men or women. In case there is pressure on the travel toiletry bag carry-on and one of your travel bottles leak, the water-resistant hanging travel toiletry kit bag makes sure your clothes stay dry. 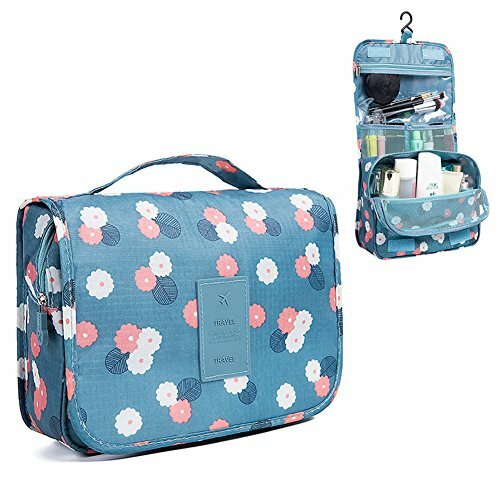 The best toiletry bag for women and men feature high-quality nylon which gives the personal organizer toiletry bag an impressive durability, water- and tear-resistant features. For a folding travel toiletry bag or a garment travel bag, whenever it has a zip, it’s important to make sure it’s high quality and has strong teeth. Also look for double-end zipper traveling toiletry bags as they provide easier access. Best travel organizer bags come with good quality zippers that work well and don’t stick. While most small toiletry bags feature an easy-to-carry top handle, there are some best travel hanging toiletry bags that also come with a shoulder strap. The strap comes in handy when you are carrying something else at the same time. From the name hanging travel toiletry bag for men and women, it’s obvious that the hook is included. However, some cheap toiletry bags come with thin plastic hooks that break easily. The best toiletry bags for travel feature reinforced hanging hooks that fit over standard doors, shower rod or towel racks and can hold the weight. Being able to hang your bag with all travel items in it frees up much of your bathroom counter space, especially when your holiday accommodation has a small bathroom. Not to mention some bathrooms don’t have shelves to put your toiletries. It’s also more hygienic, easier to organize and you don’t lose them when travel accessories are inside your mesh toiletry bag. The best travel cosmetic bags/cases offer a thick padding on the bottom and on the sides of the small toiletry bags to protect your bottles and small travel essentials. If your custom toiletry bag doesn’t have padding, it doesn’t keep the sturdy shape and goes off balance easily so your small travel bottles will go from upright to sideways. Toiletry bag is also known as body hygiene kit, travel kit, bathroom kit, makeup bag, shaving kit bag, toiletry kit, and toiletry organizer bag. It’s a container featuring nylon, leather, mesh and other materials. 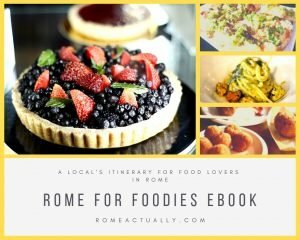 They can be used in a variety of different ways. They are designed to hold toiletries such as toothpaste, toothbrush, deodorant, travel bottles, soap, razor, medicines, hairbrush, and other similar travel kits for men and women. It was founded 30 years ago as a domestic manufacturer of luggage carts and now they are an industry leader in travel products and accessories. Their products include the Travelon toiletry bag, luggage tags and security straps, luggage scales, travel pillows and 400 more travel products. It was created with one thought in mind and that was to make the best men’s toiletry bag with a new approach to men’s fashion. They invested all their energy into crafting one single product. And thousands of highly-rated real consumer reviews prove that Vetelli succeeded with their plan. Their products include classic leather and hanging brown leather toiletry bags. They offer lifetime warranty and 100% satisfaction guarantee due to the high-quality of their goods. We included their cool toiletry bags in this review. Owned by two sisters who are passionate about traveling and made it their mission to use years of travel experience in creating affordable quality products to help other travelers stay organized. Their travel accessories include RFID passport holder, diaper bag, backpack, sling bag packing cubes and travel toiletry bags with hanger. NeatPack cute toiletry bags include compact and medium sizes which are perfect for weekend breaks and longer trips. This travel accessory brand was founded by two brothers in 2009 and it’s based in Vancouver. They design top-of-the-line products for all ages and genders. Their fame goes beyond the Herschel toiletry bag as they manufacture high-quality carry-ons, backpacks, and more. With headquarters in Orlando, since 2000 the Monogram merchant has been providing the top-of-the-line selection of gifts. In addition to Monogram toiletry bag, their products include cosmetic bags, leather jewelry roll, shaving kits, Dopp kits, travel pouch, purses, totes, stadium bags and more. Some other top travel toiletry bags for women and men are Orvis, Prada men’s toiletry bag, Nike, Ferragamo, Fossil, Cole Haan Wicked Sista and Camo toiletry bags. Also, Crumpler toiletry bags are spacious, pretty, roomy and well-designed to keep you looking good everywhere. These travel essential manufactures provide durable bags and luggage. Toiletry bags in many shapes, designs, and materials. Therefore, it’s important for you to know the types to be able to make the decision on which one is best for you. To make it easier for you we added the most popular and useful travel toiletry bags for women and men in this buying guide. Also called see-through toiletry bag, it is very common among female travelers. Usually, these bags don’t have a hanging hook and compartments. They are transparent and TSA-approved to carry liquids inside the plane. Most travel bottles come with a clear bag so you don’t have to buy another one. But if don’t have one, read on to the bottom of this travel toiletry bag buying guide. Note that most airlines wouldn’t let you take liquid (3 oz) in your carry-on bag unless they are inside a clear toiletry bag. Also called rolling toiletry bag, they are popular due to the little space they take. After folding they are similar to a tablet. These tri-fold cosmetic toiletry organizers with a hanging hook are also usually expandable and feature mesh and clear pockets for your liquids. If you are going on a short trip, these slim toiletry bags are convenient. Sometimes referred to as TSA approved shaving Dopp kit. They come in many shapes and designs and very popular as men’s travel toiletry bags. The majority of these men’s luxury toiletry bags, don’t have hanging hooks, so it’s something to be aware of when buying a leather toiletry bag. Also popular as a nylon mesh cosmetic organizer bag, they are very popular among women. They are super lightweight (10g) easy to dry and clean. These bags have usually equipped with a zipper to open and close and don’t have a compartment. So, you can’t really organize all your travel items inside one of them. However, they are usually sold in a pack of 6 pieces to allow you to put every cosmetic and travel necessity item inside one of them. 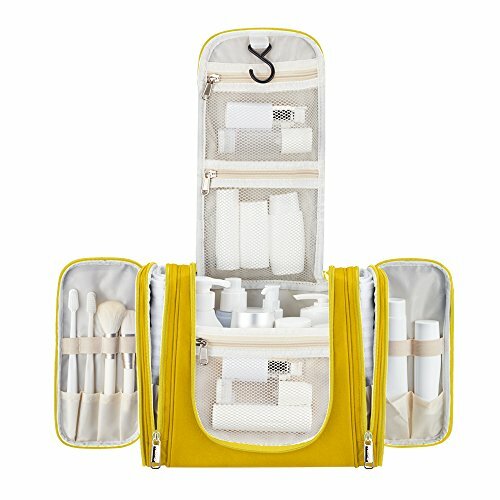 It’s another type of travel toiletry that has velcro compartments to allow you to adjust each internal section depending on the size of your items. These bags usually hold less than soft hanging toiletries bags and they don’t have a hanging hook. However, some of these waterproof toiletries makeup bags can prevent any spill inside your carry-on luggage. The last type is the one of this review, the travel hanging toiletry bag. It’s probably the most popular and practical type of toiletry bag that comes with multiple compartments to allow you to easily organize your items. The best hanging toiletry bags make traveling easy as you don’t have to unpack your items everytime you travel. Pack them once and when it’s time to use them hang the bag to access every single item without taking the other items out of the bag. These men and women’s travel toiletry bags also feature detachable pouches to help you decide how much accessories to take with you. The materials and the size of men or women’s hanging travel toiletry bag meet the TSA regulations as they are small. However, what you put inside your personalized toiletry bag also affects whether it’s TSA-approved or not. The list of the items not allowed in the carry on luggage is long and sometimes varies depending on the country and airlines. Therefore, for peace of mind, we suggest you check out the website of the airline you are taking. Note that you’ll have to remove liquids and place them in clear quart bag unless you have TSA pre-clearance. We included some TSA approved clear toiletry bag in this review. So, if your shower toiletry bag doesn’t have clear detachable pockets, we suggest you also get yourself a separate clear makeup bag to put your liquids in.